Tattered tree leaves are the calling card of cankerworms. Spring Cankerworms (Paleacrita vernata) and Fall Cankerworms (Alsophilia pometeria) are currently producing leaf-feeding damage in southwest Ohio. Both belong to the moth family Geometridae. Caterpillars of moths in this family are also called "inchworms," "spanworms, and "loopers." The common names of spring and fall cankerworms refer to the season when the flightless female moths lay their eggs. Fall cankerworm moths lay eggs in the fall; spring cankerworms lay their eggs in the spring. However, the eggs of both species hatch in the spring and it is not uncommon to find caterpillars of both species feeding together on the same tree. Distinguishing the two species can be challenging since caterpillars of both species have a wide range of color variations from light green to yellow green to various shades of brown and even black. The best way to tell them apart is to count the prolegs: fall cankerworms have three pairs; spring cankerworms have two pairs. Both species feed on a range of deciduous trees including beech, cherry, crabapple, elms, hickories, maples, honeylocust, and oaks. Young caterpillars create holes in leaves as they feed giving the leaves a tattered appearance. 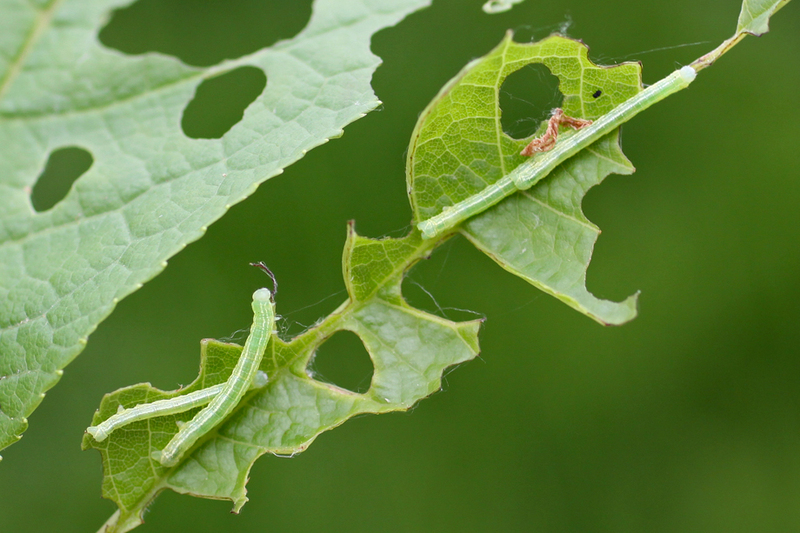 Older caterpillars consume the entire leaf sometimes leaving behind the midvein or only the petiole. Complete defoliation of heavily infested trees is not uncommon. Caterpillars also rappel down on silken threads from tree canopies if they run out of food or as they near pupation. Large numbers of dangling cankerworms beneath infested trees can make these caterpillars a serious nuisance pest as they entangle unsuspecting homeowners. Fortunately, both species only have one generation per year and heavily defoliated trees will still have time to produce new foliage for the season. While localized outbreaks may occur periodically, both species are targeted by a wide array of predators and parasitoids that typically prevent recurring outbreaks in the same location.